Ridewell is a round serif display condensed typeface created by Kostas Bartsokas and published by Intelligent Design. 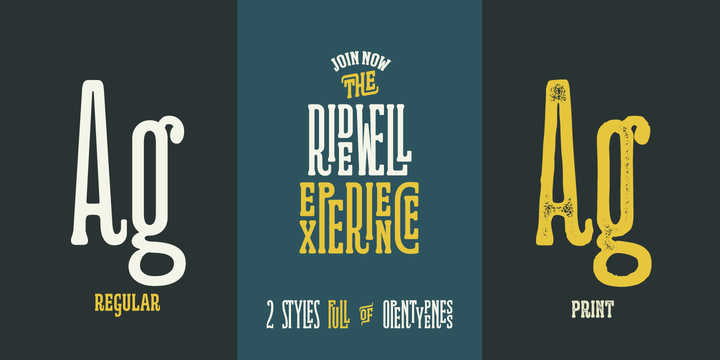 Inspired by the old wood typefaces with amazing Open Type features. Ridewell is the latest star on the horizon where tradition meets technology. Each style has a total of 1800 characters featuring full lower and upper case set, multilingual support, dedicated small caps, numerators and denominators, discretionary ligatures, stylistic ligatures, alternates, catchwords and many more different extras allowing you to create endless variations of one word, phrase or paragraph. A font description published on Thursday, October 2nd, 2014 in Fonts, Intelligent Design, Kostas Bartsokas by Andrei that has 4,136 views.